Do you think Calli really washed her hands? McCritic: Of any sort of bathroom residue? Probably. Of the insecure notion that she was being judged by two of our heroines? No way. Like a seventh grade girl who wore a clashing scarf and sweater to school, Calli is sitting alone at the metaphorical hospital lunch table. Bring her some tater tots and always offer to carry her Trapper Keeper, George. iheartizzie: I doubt it, and there's nothing wrong with that. It's just not important at 6 a.m. when you're gonna shower later anyway. In my household, we strictly adhere to the unofficial policy of "Number One, You're All Done; Number Two, Wash 'Em, You!" Married-to-McDreamy: Not a chance. Her story definitely doesn't hold water, if you will. 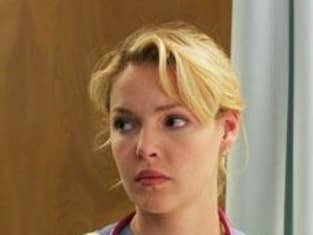 She says that she was embarrassed about running into Meredith and Izzie in the bathroom and because of that, she waited to wash her hands until she left and was in the kitchen. However, if she really was that embarrassed, why would she proceed with going to the bathroom after noticing them in there? Very suspicious indeed. Who won the Mer/Der fight in the stairwell? iheartizzie: Mer takes this one in a landslide. Just because McD's hair is one of the wonders of the modern world does not give him license to pass judgment upon his former lover. He never mentioned to Meredith that he was, how shall we say this... married. Then he dumped her when his wife appeared in Seattle. How do you expect Mer to react? And is she even sleeping around? She and McVet hadn't even kissed at that point, while the George incident -- for which she received 106 percent of the blame -- was initiated by Dr. O'Malley during Mer's peak vulnerability. Derek was out of line. She let him know. Game, set, match, Dr. Grey! Married-to-McDreamy: As much as I would like to say Meredith won the fight, as it was nice to finally see her get a backbone, I have to side with McDreamy on this one. Despite Mer's tirade, he still had the last word and called the shots by saying that they were done. McCritic: Derek came out swinging with his whorish accusations and condescending contempt, but Meredith withstood this early flurry and delivered the ultimate knockout blow: a direct order (he doesn't get to call her that!) followed by a stern, rational guilt trip (he did, indeed, break her). Before Derek calls this kettle loose again, he may wish to take a look at the promiscuous pot lying next to him in bed each night. So Meredith is scary and damaged. Pick another character and describe him/her in two words. McCritic: Preston Burke: Puurrrr. Fect. iheartizzie: George O'Malley. Bad. Hair. Will Dr. Burke and Cristina break up in the season finale? hard to see something driving them apart. Married-to-McDreamy: Married-to-McDreamy certainly hopes not. 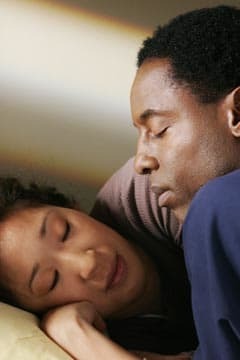 Despite their obvious differences and newfound problems in the bedroom, Burke and Cristina compliment each other and without their bizarre banter, the hallways of Seattle Grace just wouldn't be the same. McCritic: As we learned last week, Burke isn't a a natural talent. He had to practice and work his way to the top. If all those years of Tantric dedication result in a partner who can't even remain awake to appreciate such sexual skills, it's time for him to move on. Find someone else, Preston. Then, when the series climaxes next week, maybe you will, too. MEREDITH: "You don't get to call me a whore. When I met you, I thought I had found the person that I was going to spend the rest of my life with. I was done! All the boys and all the bars and all the obvious daddy issues, who cares? I was done. You left me. You chose Addison. I'm all glued back together now. I make no apologies for how I chose to repair what you broke. You don't get to call me a whore." DEREK: "This thing with us is finished. It's over." FINN: "Nobody asked you to cook." MEREDITH: "I know. I'm just saying... you know, I don't cook. So you don't have to cook, I don't expect you to cook for me." FINN: "Okay, look. You, sit there. I want you to drink this and try really hard to act like you aren't scary and damaged." MEREDITH: "I'm not scary and damaged." MEREDITH: "No, I'm not scary or damaged." FINN: "Mmm hmm. Alright. Why don't you tell me about your family?" MEREDITH: "Okay, me not wanting to talk about my family does not make me scary to damaged." FINN: "Okay, tell me about the last guy you slept with."